FT1000, RigExpert Plus USB interface, and antennas: A4S, 40 m Dipole and G5RV. I had to bring only my laptop. Conditions were a bit better than last year. With proper breaks the score could be even better. Thanks to all for QSOs. 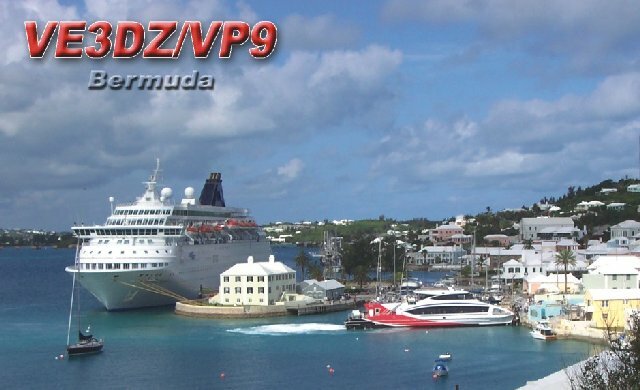 Well, if there are some places on the Earth which may be called Paradise, then Bermuda is definitely one of them. The streets are super clean and beaches are the best I've seen in my life. Looks like for the WPX CW it was the right place, where I appeared to show at the right time (considering band conditions)! I have never been to VP9 before and I was very happy to have an opportunity to combine business trip and pleasure, being able to operate yet another Contest from a DX Location. Mr. Ed Kelly, VP9GE offers nice apartments and station for rent, details may be found on www.vp9ge.com .The station and antennas look quite modest at first sight, but boy - was I mistaken about it! When I first started operating on Thursday night before the Contest using just bare radio and A4S tribander I was amazed by signal reports from the EU and Eastern U.S. - mostly “59” or “59 Plus”. All antennas are quite low above “ground” level, but probably the most important thing is that ground is very poor on Bermuda (mostly rock) and Ed lives on a top of the hill. Ed provided two radios - FT1000 and FT920, I just had to bring my RigExpert USB interface for CAT, PTT and CW keying and my Dell laptop. I intended to use my SO2R box, but unfortunately at that moment the R6000 vertical was not available (broken) which made SO2R operation impossible. I was quite busy on Thursday and most of the day on Friday so didn't have a chance to play much on the bands before the Contest. However, when I started on 20, the pile-up was really good and I ended up with 146 Q's in the first hour - my best hour in this contest. Most of my contact were U.S. East Coast though. 40 and 20 were open all night, and I made a few 80 m Q's (even into EU!) with 1 contact on 160 (I guess Brian VE3MGY appreciated the rare VP9 mulitplier that called him on top band!). 40 metres was amazing! I had a feeling that I was really LOUD at times. But honestly, I always had to pick my run frequencies higher up the band to avoid QRM from big guns fighting for the band edge. I worked my last EU on 40m around 06:30 UTC before making my first break for a short nap. One little secret, which is not so secret for those who live in North America outside U.S., is to work a lot of 80 and especially 40m Q's for double points. You get double points for each European on low bands, but in addition to that you get 4 points for each U.S. station worked, which makes it more than if you would work EU on high bands! For years, while operating LP from home, my strategy was to work as many U.S. stations on 40 m in the morning as possible, which sometimes brings you not only double points, but also rare U.S. prefixes (multipliers). The big guns are fighting on 20 for the good run frequency in order to work EU and you just keep collecting your double points. Anyway, sooner or later you still have to go back to 20 metres and that's where problems begin. I could not establish run frequency up until probably 1600 UTC, unless I pointed my beam to the U.S. which immediately resulted in the pile-up from East Coast. I believe VP9 is ideal QTH for the ARRL - I was able to work U.S. with no problems on all 6 bands Anyway, my rate sucked quite a bit in the morning hours varying from 92/hr (best) to 36/hr (worst). I believe in the desire of getting double points on 40 I missed a 20 m opening to JA, but the good news was that 15 suddenly opened to EU. I was making some EU contacts on 15 when Mr. Murphy decided that everything was probably going to well for me and sent a local guy in the truck down the street to hit the pole and the power disappeared right when I was trying to copy an exchange (sorry, OE5CWL!). That was my 2nd (not planned) break. Fortunately, Ed was able to run emergency generator and after an hour and a half I was back in business and even managed to catch the remains of sporadic opening to EU on 10 metres. Then again, 20 metres in the late afternoon and later in the evening 40 metres were great with reasonably good rates of 100+/hr. I started to feel that I'm falling asleep at the keyboard and took my last 6 hour break around 0500 UTC. Sunday was pretty much the same - trying to stay on 40 for as long as possible to work 4-pointers, then struggling on 20 and 15, except this time 15 metres produced almost no Europe. 10 was reasonably good, but again - to Stateside only. Again I was surprised how sharp the A4S was on 10 metres. I decided to call CQ for a couple of minutes towards EU and turned antenna to NE. After few CQs I decided to point back to the U.S. and when I turned my beam back to my surprise there was a K8 calling CQ TEST on my frequency. Needless to say that we absolutely did not hear each other. I stayed on each band for about 15-20 minutes in order to maintain some rate until late afternoon when 20 started booming again into Europe. Many times when I was trying to copy serial number from a weak European, some big gun would suddenly appear on my frequency and start calling CQ TEST without any warning! Last couple of hours were really good on 20 and 40 with both EU and NA in the log. I finished with a bit less than 2600 QSO, which was an unexpected surprise for me. 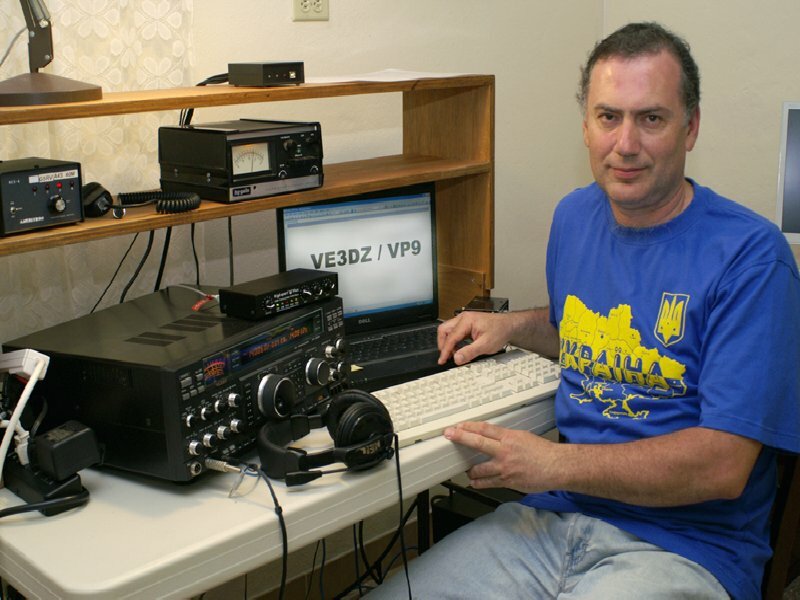 Thanks again to Ed, VP9GE, for providing a station for this operation and to everybody who called for all the contacts. Looking forward to work you all again. Special thanks to Paul, VE3TA for his help and support. Anyway, just to clarify on this subject (see information above) - the power limit in VP9 is 150 watts and amplifiers are not permitted on the island.